Wednesday morning brought more olfactory surprises. 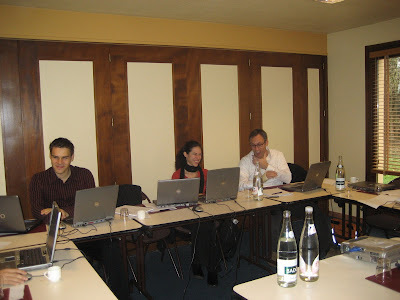 On Wednesday and Thursday we had to conduct training in the conference room of a local hotel. The room was spacious and comfortable, much more so than the cramped meeting room we were in on Monday and Tuesday. Their smiles belie their suffering. Everything was going great until around 10 am, when 3 or 4 men started walking around outside the conference room. They were holding a large hose connected to a truck. Within a few minutes the class was moaning. The men were emptying the septic system at the hotel. It was a horrible, horrible smell. Dirk exclaimed, "Oh, it's making my eyes water!"